Our friend Jon Roland of the Constitution Society has proposed these Clarifying Amendments to federal and state constitutions. These do not make substantive changes in what was originally understood. 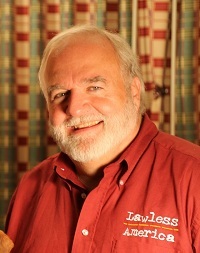 Please provide your feedback at www.facebook.com/lawlessamerica. In this Constitution all rights are immunities against the action of government officials, not entitlements to receive some service or benefit. Every immunity is a restriction on delegated powers, and every delegated power is a restriction on immunities. Delegated powers and immunities partition the space of public action. The exercise of a right is not subject to regulation, except to allocate use of a scarce resource, or to taxation, and only to insignificant incidental burdens by government actions at any level, unless there is an explicit exception to the contrary, in this Constitution. All persons have the right to a presumption of nonauthority. Any person may file, without prior consent of any court, as demandant, in the name of the people, in a court of competent jurisdiction, a writ of quo warranto, habeas corpus, prohibito, mandamus, procedendo, certiorari, scire facias, or other prerogative writ, including a demurral, and upon service of notice to respondent, respondent shall have three days, and not more than 20 days with cause, to prove his authority to do or not do what the writ demands. The writ filed shall be the summons, with no further action needed by the court, which shall not treat the writ as a petition or motion for injunctive relief. The burden of proof shall rest solely on the respondent. The court shall hold a hearing within five days of receipt of the response from the respondent, and ahead of any other business before the court except another prerogative writ. Either demandant or respondent shall have the right to trial by a jury of at least twelve, with twelve required to sustain the claim of authority of the respondent. On a writ of habeas corpus the respondent must produce the individual held regardless of the legal or factual issues, and failure to do so, unless the medical condition of the subject requires otherwise, shall result in immediate release. The order granting the relief demanded shall issue by default if a hearing is not held or a decision not made. Only the Supreme Court of the United States shall have jurisdiction to decide a writ of quo warranto, upon impeachment, to remove from office for perjury of oath, fraud, or ineligibility, or restrict the exercise of power, of the President or Vice-president, a member of Congress, or a judge of the United States, but any United States court of general jurisdiction shall have jurisdiction for lesser officials, subject to appeal to higher courts, and the President and Vice President shall have the right to a verdict by a jury composed of two adult citizens selected at random from each state. The power to regulate shall consist only of the power to restrict the attributes or modalities of the object regulated, and not to prohibit all attributes or modalities, or impose criminal penalties. Commerce shall consist only of transfers of equitable interest and possession of tangible commodities, for a valuable consideration, from a seller or lessor to a purchaser or lessee. It shall not include transport without such transfer or interest, nor extraction, primary production, manufacturing, possession, use, or disposal, nor shall it include the other activities of those engaged in such transfers. It shall not include energy, information, or financial or contractual instruments. Commerce among the states shall not include sales or leases within a state. Article I Section 8 Clause 18 of this Constitution shall be construed to include only enablement of the completion of duties by duly elected or appointed officials, to make a limited, reasonable effort strictly necessary to exercise an express power narrowly construed, and not to go beyond completion of the duty to do whatever might be deemed convenient to get an outcome or result for which the effort might be made. Section 1. 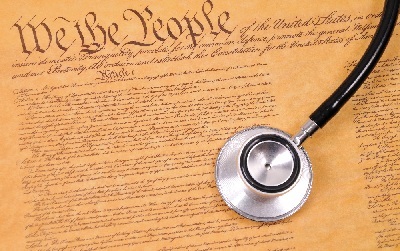 The judicial decisions in every court of the United States and of every state shall be made under the common law terms and rules of due process and construction in effect in the United States as of 1787 that do not conflict with this Constitution or statutes enacted within its authority. Section 2. If there is any significant doubt concerning whether an official has a power, or a person has an immunity from the exercise of a power, the presumption shall be that the official does not have the power, or conversely, that the person has the immunity. Section 3. On all constitutional issues precedents may only be regarded as persuasive and never binding, and binding stare decisis shall not be used as a rule of construction. Section 4. Constitutional text shall be construed only on historical evidence of the meaning and understanding of the terms for, first, their ratifiers, and second, their framers. Section 5. Equity and prudential decisions shall not be regarded as precedents. Section 6. The powers to tax, spend, promote, regulate, and prohibit (or punish), shall each be construed as distinct, with none derivable from any of the others, and none shall be exercised as a way to avoid the lack of a power to do one of the others. Section 7. No power applicable to an object, or any necessary and proper power derived from it, shall be extended to other objects with which it may be aggregated or causally connected, except to separate the applicable objects from the others. No person shall be denied standing to privately prosecute a public right for at least declaratory or injunctive relief, even if he or she has not incurred, or does not expect, personal injury resulting from the failure to grant such relief. In all trials in which there are mixed questions of law and fact, including all criminal jury trials, and all jury trials in which government officials or agents, whether general, state, or local, shall be a party, parties shall have the right not to have decisions by the bench on questions of law made before all arguments can be made before the jury, excepting only arguments on defense motions in limine that cannot be made without disclosing evidence properly excluded. Jurors shall receive copies of all applicable constitutions, statutes, court precedents, and legal arguments, including those of intervenors and amici curiae, and access to an adequate law library in which they can do research. No person shall be unreasonably impeded from access to a randomly selected grand jury of 23, who, if they should return an indictment or presentment, may appoint that person or any other to prosecute the case, and shall decide which court, if any, has jurisdiction, and whether any official shall have official immunity from suit. The primary meaning of "militia" shall be "defense activity", and only secondarily those engaged in it, or obligated to engage in it. All citizens and would-be citizens have the legal duty to defend the constitutions of the United States and their state, and the members of society, from any threat to their rights, privileges, or immunities, in response to a call-up by any person aware of a credible threat. Any call-up that does not require everyone to respond shall select those required by sortition. Jury duty shall be regarded as a form of militia duty. Militia may not be kept in a called up status beyond the duration of an emergency. Congress and state legislatures shall have the power to enforce this duty by appropriate legislation. Militia shall be maintained in a state of readiness sufficient to overcome any regular military force it might encounter. Those who may engage in militia shall have any weapons in common use by regular military, subject only to the directives of local elected unit commanders during operations while called up. If Congress or any state or local legislative body shall fail to provide for organizing, training, or equipping militia units, persons shall not be impeded from organizing, training, and equipping themselves independently. Clarification of "bill of attainder"
A bill of attainder shall consist of any legislative disablement of an immunity, either for an individual, group, or the people in general, without proof beyond a reasonable doubt, decided by a jury in each individual case, that he or she has committed a crime or is dangerously incompetent. Clarification of "title of nobility"
A title of nobility shall consist of any legislated or judicially conferred privilege or immunity, not enjoyed by all, or to the detriment of others, that is not essential for the performance of legitimate official duties, and a grand jury may authorize civil or criminal prosecution of an official for exceeding his jurisdiction or abusing his discretion. Clarification of "declaration of war"
A declaration of war shall specify the state or organized body that is the enemy, the casus belli or casus foederis requiring its issuance, the commencement date, and the terms for its conclusion. The identification of the enemy shall be sufficiently explicit to allow persons of common understanding to recognize them, and not be left to executive officials to define the boundaries of who is included. "Piracy" shall consist only of warlike acts committed by a nonstate actor against persons or property of a country foreign to him. Letters of marque and reprisal make the person to whom they are issued a state actor, and under a declaration of war all citizens are to be regarded as state actors with respect to the foreign state defined in the declaration. Clarification of "trial by jury"
Trial by jury in criminal cases is not a right that may be waived by the defendant. It is a mandate even if the defendant pleads guilty. The number of jurors in all cases must be twelve. They must be randomly selected from the general body of citizens. They may not be asked about their knowledge, experience, or opinions about the law in voir dire. They must be unanimous to convict but not to acquit, and failure to convict shall be deemed acquittal. This provision applies to all civil or criminal cases, national, state, or local. Congress shall not have power within nonstate territory in excess of powers provided by the constitutions of at least three-fourths of the states, being those that delegate the least power to their governments on the same subjects. Congress shall not have power to disable a right or penalize any person on the basis of an administrative or due process proceeding in another jurisdiction, or lack thereof, or an administrative or due process proceeding in the same jurisdiction that does not explicitly disable the right as part of the final order of the court, upon conviction by a jury for a crime or a unanimous jury verdict finding dangerous incompetence. Clarification of "speech" and "press"
"Speech" and "press" shall include the production and distribution of any communication, private or commercial, other than inducement to immediately commit a crime or act of war, or to give aid and comfort to a declared enemy. The term "general" in "general welfare" in Article I Section 8 means "not special", and it is not a delegation of power but a restriction on the power to tax and spend, meaning that government shall exercise no power in ways designed or intended to burden or benefit one part of the population over another, except in minor ways incidental to the proper exercise of delegated powers. The exceptions to appellate jurisdiction of Article III Section 2 Clause 2 only mean original jurisdiction, not no jurisdiction. There must always be some court somewhere open to hear and justly decide any judicial question, original or appellate. Clarification of "cases" and "controversies"
The terms "cases" and "controversies" used in Article III Section 2 shall not be limited to parties with a direct stake in the decision, but shall include any case for which the court can grant relief, including declaratory and injunctive relief, private prosecutions of public rights, trustees representing their trusts, and prerogative writs. Government shall exercise no power within the territory of the United States, based on a treaty, not otherwise delegated to it by this Constitution, other than powers to administer trust territories or protectorates. A person may be pardoned only after conviction, and the pardon does not nullify the conviction. It is only a declaration that the executive will not enforce it. A declaration by a president or state governor that he will not enforce a criminal conviction against a person, does not bar enforcement by another person to whom a warrant to do so may be issued by a court of competent jurisdiction. Sovereign immunity of a state or the nation shall not be a bar to suit, only to execution of judgment against assets not provided by an act of Congress or the state legislature for payment of claims. 1. A tax shall be considered direct if under the totality of circumstances in which it is applied, less than half of it is likely to be passed through to a further individual purchaser of the thing taxed as a higher cost of purchase, and indirect if half or more of it is likely to be thus passed through. 2. An indirect tax may only be imposed on a profitable transaction or use the profit on which is or is readily convertible into a monetary equivalent. 3. A direct tax may be imposed on being or having something without a profitable transaction involved. 5. be at a rate beyond the point of diminishing return of revenue. 5. When in doubt, a tax shall be considered direct. 6. Taxes on corporate entities or trusts shall be considered indirect. A crime, whether under the laws of the United States or a State, shall be considered to have been committed at the point in space and time where mens rea and actus reus concur, not where the harm is caused. Territorial jurisdiction for treason, piracy, and offenses against the law of nations is not confined to the territory of the United States, but personal jurisdiction for treason is confined to United States citizens. No regulation, ordinance, or other rule issued as anything but an act of Congress shall have the force of law on the general public, but may be applied only to government agents. The law of trusts as of the date of ratification of this Constitution is hereby recognized as part of the common law that preceded this Constitution and was incorporated into it. The settlor, trustee, beneficiary, and the trust itself shall each be deemed as distinct persons in any court of law of the United States and any State, the trust represented therein by the trustee.